Having just made apricot curd, I was keen to start using it in some baking. With a week of annual leave, it seemed like a good time to have some friends over for tea. At about the same time, I had also been sent a cupcake stand to review. So, apricot curd cupcakes it just had to be. Along with these I made some goats cheese and orach muffins based on a Rachel Demuth recipe from Green Seasons and some cinnamon and chocolate buns (recipe to follow). After spending some time mulling over how I was going to use the apricot curd in cupcakes, I eventually decided to base it on the raspberry and white chocolate ones I made for the first We Should Cocoa; these were a great success. Having recently fallen in love with cardamom sugar, the brainchild of Vanessa Kimbell, I substituted that for the vanilla sugar. Melted 125g unsalted butter with 50g white chocolate in a large bowl over a pan of hot water. Stirred in 150g cardamom sugar. Sifted in 180g flour (80g wholemeal, 80g white, 20g coconut) and 1 tsp baking powder. Stirred in 70g 0% fat Greek yogurt and 50 ml water. Spooned roughly half the batter into 12 cupcake cases. Placed a tsp of apricot curd on top of the batter the spooned in the remaining batter. Baked for 22 minutes at 180C. Turned onto a rack to cool. Stirred 4 tbsp of apricot curd into 125g of mascarpone and mixed until fully incorporated. Spread over the cooled cupcake cases and decorated with orange stars. As luck would have it, the weather was set to be fair, so I took the opportunity to have a tea party down at the field. Our plot is looking really good at the moment, with the vegetable beds full and flowers blooming everywhere. Chairs were kindly brought along by friends as well as cups and a flask of tea. With 13 of us, aptly a bakers dozen, we had just enough chairs and just enough food. What with good weather and good company, I can’t think of a better way to spend time with friends. Although this could very easily be an entry for this month’s We Should Cocoa, I have something else in mind for that. I was really pleased with the cupcake stand, supplied by Find Me A Gift. It’s a four tier steel stand which takes up to 23 cupcakes or muffins. The stand can take any sized cupcake and you could dispense with one of the middle layers if you had fewer items to display. Twenty three seemed like a good number as this is two standard bakes of twelve cupcakes, which leaves one left over to be …. errr…. tested beforehand! The cakes all sat well on the stand where they had sunken holders. The only one I was concerned about was the very top one which relied on balance alone. Even though there was a fair breeze outside, not a single cake was blown off – not even the top one. I thought it made for a good display and showed off my cupcakes well. One step nearer to my pop up tea room! What a delicious spread to share with friends on a warm sunny day, especially with the knowledge of a week of annual leave on the cards! The garden and plot looks beautiful! And how did the cardamom sugar work out? Unusual combo and sounds delightful! Oh you big tease! Can’t wait to see what you have in store for We Should Cocoa but in the meantime I am bookmarking the recipe for these cupcakes! Love the sound of that combination of flavours. Kate – thank you, it was just one of those days that worked and everything came together beautifully. The cardamom sugar was more about adding depth of flavour than a distinct and obvious taste, but I’ve fallen in love with it. Sonia – thank you. I’m a big fan of cardamom. Chele – well it’s all down to you. I’d never have thought of apricots at all if it hadn’t been for you and now I’ve baked tons (well perhaps not quite tons) of things with apricots – an inspired choice. Phil – it’s a good one indeed. you have excelled yourself again – I could really tuck into that stack of cupcakes right now. Trying to stick to a healthy eating mission at the moment (it is NOT a diet) and allowing myself one treat a day. Wish it could be one of those! Actually already had a v small bar of Aldi plain chocolate that is surprisingly good. Treats over for the day! What a lovely way to spend the day. Your garden looks so inviting and the apricot curd cup cakes are very tempting. These look so tasty! I have never considered white chocolate cupcakes because I don’t like white chocolate but I might have to give these a go, especially with the apricot and cardamom curd. I’ll have a look on Find Me a Gift too! Thanks for this great blog post. Natasha from The Rambles and Shambles blog. A;ricot curd sounds amazing – I want to try some! I’m in love with your tablecloth! Apricot curd sounds like something I should definitely become acquainted with, and your cakes look fantastic. Now they look delicious, and sitting pretty in the middle of your garden…I couldn’t think of a better place to enjoy them with a bunch of friends. …and pop up tea room? Do tell! Thank you for checking out my blog! These look gorgeous – so moist and you had me at white chocolate! Do you think they’ll work as well with apricot jam instead or lemon curd? I can’t wait to make them! Kate – yes me too – one treat a day. Very difficult at work when there is always cake biscuits or sweets in the office. I’m not very good at resisting! Janice – thank you. I kept having to look back at this photo and pinch myself – how could we have sat out in the field when it’s done nothing but pour with rain ever since (until today that is). Brittany – thank you. If you ever get your hands on a load of apricots, it’s worth making the curd – it’s delicious. Made With Pink – thank you. Natasha – thanks for commenting. White chocolate in cakes is not easily identifiable, but it helps to give them a certain richness which I like. Shaheen – even with chocolate in? Xinmei – do try some, it is amazing. Vicki – I’m sure these would work very well with apricot jam. I tend not to like things too sweet and the curd is quite sharp so it gives a nice contrast. Ahhh, how lovely! I am desperate for an afternoon tea in my garden now! It is such a lovely way to spend time with friends, especially with these cupcakes of yours that sound absolutely divine. I must get myself some cardamom sugar! Hazel – thank you. Cardamom sugar is dead easy. Just have a jar of sugar with a handful of cardamom pods infusing it. Just keep topping the jar up with more sugar each time you use some. Those look delicious and beautifully presented on your cupcake stand. I love the idea of cardamom sugar too – do you leave the husks on the cardamom seeds or do you crush them a bit? Must try this! C – thank you. So far I’ve just bunged the pods in – this gives quite a subtle flavour but a wonderful scent. I think I need to experiment though and try crushing the pods – I expect that will give a much more pungent flavour. Baking Addict – We were so lucky with the weather, it rained the day before and the day after. Would love to do it again, but have no shelter down there. Love cardamom – my favourite spice. I’d use ordinary eggs than duck ones just out of personal preference. You and me both. I use duck eggs in curd because the huge yellow yolks just give it such a wonderful colour, but hens eggs would be absolutely fine. I have not heard of apricot curd. They look delicious. I wouldn’t have thought of using apricot curd, thanks for the idea I will definately be trying this out. Made this and it was gorgeous!!! 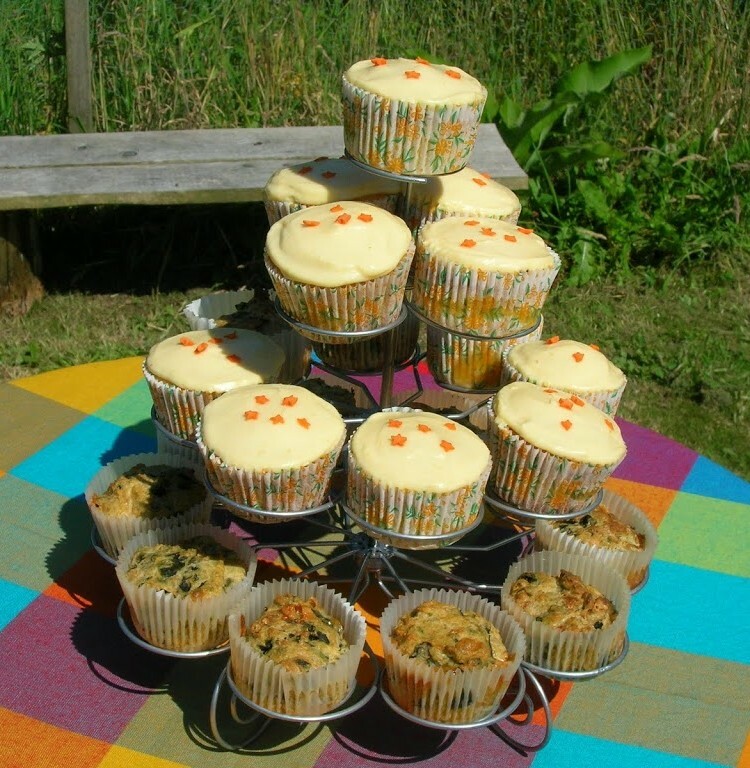 I would love a cupcake stand one day – but where to put it? Lovely garden in the picture. Those look and sound absolutely gorgous.